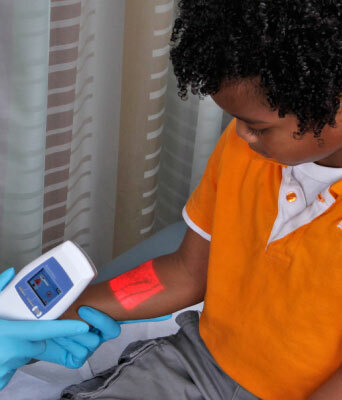 Vein visualization is an innovative technology that assists healthcare professionals with finding the best veins for IV starts and blood draws. Also known as vein mapping, this technology creates a real-time visual “map” of the veins on the surface of the skin. Vein visualization (also known as vein illumination) uses Near-infrared (NIR) imaging for detecting veins. This proven technology enables accurate visualization of the veins under the skin. The AccuVein AV400 employs two safe barcode-scanner class lasers: an invisible infrared and a visible red. The two lasers work in tandem to provide a real-time image of the subcutaneous vasculature up to 10mm deep. First, the hemoglobin in the blood absorbs the infrared light, so there is a reduced amount of light reflection from the veins. Then, a custom detection system uses this change in reflection to determine vein location and pattern, which it digitally projects on the surface of the skin. Lastly, the red laser makes the vein mapping visible to the clinician. The result is a visual projection that has center line accuracy of less than the width of a human hair. Independent studies show that the AccuVein® vein detection device improves first stick success by 98%! Read the clinical evidence here. AccuVein AV400 is the essential tool for safer and more efficient venipuncture procedures. It’s arguably unfair to subject patients to venipuncture procedures without it! See what AccuVein customers have to say here. “Incorporate vein visualization technology as a routine strategy for difficult or poor venous access. Visualization technology can improve success rates, decrease unsuccessful insertion attempts.” “Recommendations for Improving Safety Practices With Short Peripheral Catheters”, Journal of Infusion Nursing:.